You probably didn’t have acne in mind when you were looking for something in common with your teenager. Acne is a disease involving the sebaceous glands of the skin and effects over 80% of adolescents and many adults. Sebum (oily substance produced by our bodies), combined with excess skin debris, sticks together in our pores causing them to become clogged. Obagi Skin Care is a stand alone skin transformation product that works wonders when used over time. FotoFacial results usually happen over several treatments, with virtually no downtime. Advanced Chemical Peels work wonderfully in conjunction with the other procedures for more challenging cases. Dark brown spots, known as Lentigos, arise because of genetics, aging, and of course sun exposure. This not only affects the face, but also the neck (décolleté), and the back of hands and arms. Obagi Skin Care is a stand alone skin transformation product that works wonders when used over time. 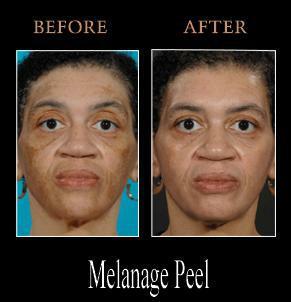 Melanage Peel is a treatment with faster results, usually in one treatment and 5-7 day recovery. FotoFacial results usually happen over several treatments, with virtually no downtime. DOT Therapy, while usually bringing the desired effect after only one treatment, may also ask for a longer downtime. Get the red out.People think you’re embarrassed, but you’re not. Rosacea is a chronic condition where inflammation of skin causes a variety of undesirable affects such as redness & excess flushing. Some people experience acne like blemishes. Obagi Skin Care is a stand alone skin transformation product that works wonders when used over time. FotoFacial results usually happen over several treatments, with virtually no downtime. Sun damaged skin often leaves us with wrinkles, brown spots, broken blood vessels and a sallow, dull complexion with large pores. Obagi Skin Care is a stand alone skin transformation product that works wonders when used over time. FotoFacialresults usually happen over several treatments, with virtually no downtime. Advanced Chemical Peels work wonderfully in conjunction with the other procedures for more challenging cases. Melasma leaves excess brown patches on the face, most pronounced on the cheeks, forehead and upper lip. It may have started during pregnancy or when you were taking birth control pills. It has gotten worse every summer. Obagi Skin Care is a stand alone skin transformation product that works wonders when used over time. FotoFacial results usually happen over several treatments, with virtually no downtime. 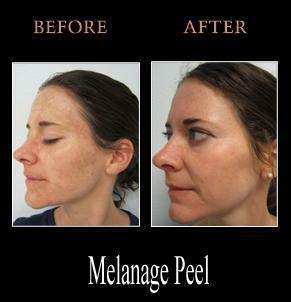 Melanage Peel is a treatment with faster results, usually in one treatment and 5-7 day recovery. Do you always look angry or tired even when you feel fine? It takes years to create unsightly wrinkles, but you can start to erase them in a series of effective treatments. 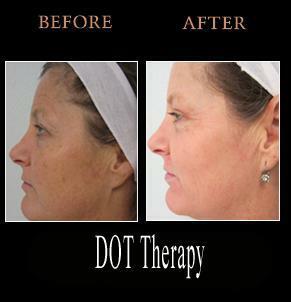 DOT Therapy, while usually bringing the desired effect after only one treatment, may also ask for a longer downtime. Volume can be added to sagging skin through Fat Transfers.